Traffic in Miami is Bad. But Avoidable. Traffic in Miami is bad. I mean real bad, to the point that many people schedule their lives around not having to sit in it. While it may not offer the endless miles of gridlock of Los Angeles, or the unmoving narrow streets of New York, what we lack in volume we make up for in insanity. But traffic here, unlike in those cities, is avoidable. Dubbed “Useless 1” by the locals, it used to be the route from downtown Miami to the Keys. Now it is the bane of the existence of most people living in Dade County. This road travels Northeast and Southwest, and while it may be marked “North” and “South” do not be fooled; it is a diagonal. Under no circumstances should you ever get on any portion of this road going northbound between 6:30-9:30 AM. Same applies going south between 3-7:30 PM. While there are distinct times you can more or less guarantee yourself a long wait in US-1 traffic, the rest of the day can prove unpredictable. Especially during road construction. US-1 still gets sticky in the afternoons going both ways starting at about 2. So if you can find ways around it, use those. And on weekends, US-1 is frequently congested with people out running errands, taking kids to little league games, and generally enjoying the lovely South Florida weather. In their cars. I-95 also has what are known as HOT (High Occupancy Toll) lanes that run from just north of Downtown Miami at the interchange to SR-112 up to the Golden Glades Interchange in North Dade. You can only access the northbound HOT lanes from I-95 north BEFORE 112/I-195, and can only exit at the Golden Glades. So if you have to exit anywhere between downtown and NW 183rd Street, DO NOT GET IN THE HOT LANES. 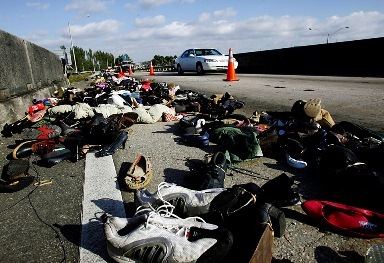 While speeding over the plastic dividers may seem tempting, it is extremely dangerous even by Miami driving standards. Similarly, you can only access the HOT lanes southbound just north of the Golden Glades then again just after it. But if you need to exit southbound between NW 183rd street and I-395/836 West, DO NOT GET IN THE HOT LANES SOUTHBOUND. 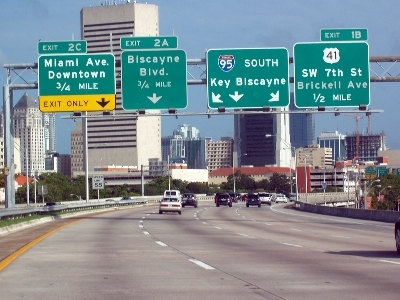 You can exit to go West on 112 – Airport Expressway to get to MIA. But its eastbound extension, I-195 to Miami Beach is not accessible from the HOT lanes. So if you are going to mid or north Miami Beach, the HOT lanes are not an option. The toll varies by how much traffic is traveling in the lanes at any given time. So what might cost you 25 cents late at night could be five dollars during rush hour. And the HOT lanes only accept SunPass, so if you live here get one and if you’re visiting make sure to rent one from the car agency. Cops rarely patrol it, so you can go a lot faster even during times of light traffic. Just pray you never break down and remember: NEVER CROSS INTO OR OUT OF THE HOT LANES THROUGH THE PLASTIC DIVIDERS. The Dolphin is an interesting animal. 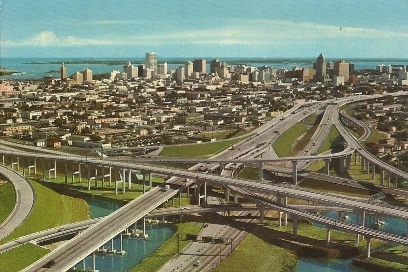 At one time this freeway passed by the home of the Miami Dolphins at the venerable Miami Orange Bowl. And while the Dolhins have moved north to SunLife Stadium ,and the Orange Bowl is now the futuristic Marlins Ballpark, the name of State Route 836 still remains. 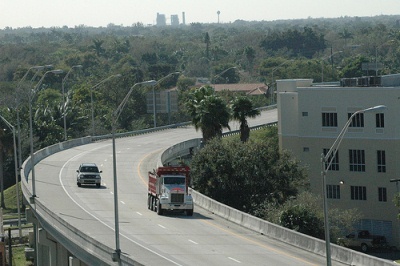 The Dolphin is the major East-West Expressway in Dade County. Do not even think about going East between 7-9:30, and even after that the mile or so in front of the airport can slow down considerably. Be advised there is a $1.25 toll going eastbound into Downtown and South Beach. 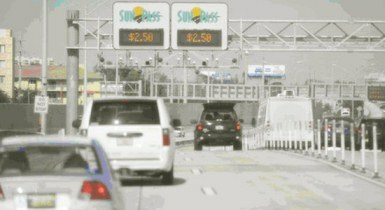 And if you don’t have a Sunpass, the wait at the toll booth can be quite lengthy. You can exit at NW 27th Ave. to avoid it, but quite often taking that detour defeats the purpose of the early exit. Also avoid going west during the above mentioned evening Rush. If you exit before NW 107th Ave., you will avoid the Westbound toll. But if you need to get to the Turnpike or points west of there, it will cost you $1.25. Do not be fooled. Just because the Turnpike costs money doesn’t mean it is not jam-packed. Quite the contrary. North of SW 40th Street up into the County Line the turnpike can get real nasty going north in the morning. Southbound at night is worse, as starting as far north as the NW 106th St. (not far from the county line) traffic can get backed up well into South Dade, as far as SW 184th St. That’s a long way considering a mile in Dade is 16 streets. Also, be advised that in Dade County the Turnpike is cash free. Meaning if you do not have a SunPass, the toll plaza will photograph your license plate and send you a bill for a jacked-up toll rate. So, again, if you are a visitor make sure you get a SunPass when you rent your car. And if you are a resident, make sure you buy when before you get on the road. They are available at Walgreen’s and Publix for $4.99, and that includes $5 worth of tolls once you activate the SunPass. These are all shortcut expressways that don’t go very far but rarely have any traffic. You can use them to bypass some of the more congested Expressways for a short time, but do not use them unless they are a direct route to where you are going. Also, be advised these expressways are also cash-free, so again you will need SunPass. Dade County runs on a fairly simple grid system provided you are not in Hialeah or Coral Gables (more on those later). The grid, much like everything else in this city, was planned with all the foresight of a 17-year-old’s retirement plan. I’m not sure why, but a good deal of people in Miami are convinced taking surface streets is faster than taking freeways. Like somehow gridlock combined with traffic lights is faster than the old “no-light” system. Do not listen to these people. If there is one symbol for everything that is wrong with Miami, it is the Palmetto. Why is the Palmetto so awful? Well, there are a few reasons. First are the areas it travels though. Doral, which you may have heard of for its famous Golf Course, has also become a popular location for Office Parks. As has Miami Lakes, another area right off the Palmetto. As has Kendall. So at any given time you have a good portion of Miami’s population driving to work on this same stretch of ever-constructing road. Secondly is Hialeah. Hialeah aside from being the poster-boy for lawless driving, is also home to most of the warehouses in the city. Add in enough semi-trucks to fill the highways of most states in the Midwest, sprinkle in some gravel trucks coming from the nearby rock quarry, add that to perpetual construction and suburban commuters and you have a recipe for hours of head-pounding frustration. Interestingly, Hialeah is also home to a lot of trucks selling fruit off the back. Or trucks selling just about anything off the back. And it is not uncommon for some of these exemplary cases of defensive driving to get into accidents on the Palmetto. So say you are driving to work in Doral one day and, whoops! All of a sudden a truckload of flip-flops has overturned in the middle of the road. Or bananas. Or churros. Either way you may be redirected to the dreaded Hialeah Surface Street, which encompass an entirely different numeric grid in the middle of Dade’s countywide grid. Did I mention the mayor of Hialeah once punched guy out on live TV during a traffic jam on the Palmetto? I think you’re starting to get the idea. But there is good news. A decade-long widening project has made the Palmetto somewhat more bearable. Traffic now flows pretty smoothly in either direction until a mile or so before the interchange to The Dolphin (SR-836). The County is currently building a massive new interchange there, but for now it’s a giant mess. Make sure you slow down (you’ll pretty much have to anyway) and follow all signs carefully once you get there. The interchanges come up quick and are in counter-intuitive places. 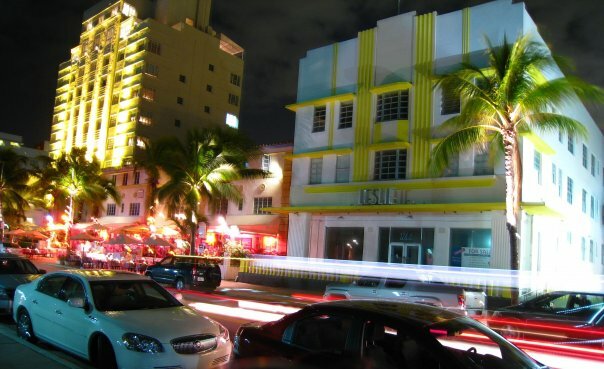 There is a city just southwest of Miami called Coral Gables. It is home to expensive homes, expensive shopping, expensive bodies, and street signs you couldn’t see with Night Vision Goggles. 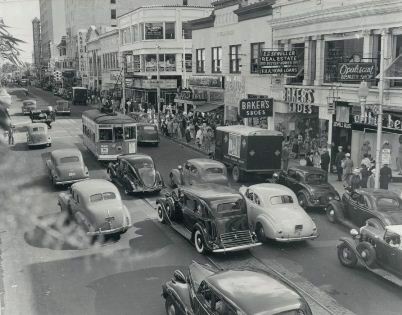 For some reason, Coral Gables, the ever-trendy rich suburb that is home to the University of Miami, wanted to be totally different than the rest of Miami. As a result, they completely abandoned the grid and instead gave us a labyrinth of winding streets with names that sound like pasta sauces. So you may be heading north on Salcedo Street and then all of a sudden you are going west on Albegna and then southeast on Anastasia. And you come out two miles south of where you started. Don’t try looking at street signs, either. In order to make ABSOLUTELY SURE you knew you were not in Miami, Coral Gables also abandoned the easy-to-read white on green street signs with the not-so-nearsighted friendly black on white. Written on stones. On the ground. So when you are driving around you not only can’t read the signs, you can’t even see them unless you happen to drive a car that sits 8 inches off the ground. The good news is the median income in “The Gables” is roughly 900 times that of everyone else in Dade County. So getting lost there, while extremely irritating, will most likely not find you carjacked like so many German tourists. However you decide to drive here in Miami, just be sure you are ready for anything. While our traffic can be horrible, it is by no means unavoidable if you set your job and residence up the right way. Understand that most of the people around you are inexperienced, old, drunk and uninsured and you will be well prepared for automotive life in South Florida. Just make sure you get that uninsured motorists coverage. It may be the one bet you make with the insurance companies you actually win. "Why Miami Traffic is So Bad (And How To Avoid It)"
You say that “if you go five blocks west of Miami Ave. in downtown you are right in the middle of Biscayne Bay.” Actually, you have to go 5 blocks EAST of Miami Ave. to get to the Bay. You say, “by no means ever get on a major street going West during morning rush or East at night.” Actually, you’ve got that exactly reversed: the heavy traffic from the Western suburbs toward downtown goes EAST in the morning; and the afternoon commute goes WEST. You say that the Turnpike and NW 106 St. is “not far from the county line.” Given that the county line is at NW 215 St., “not far” is correct compared to, say, a trip to New Jersey. As for the street stones in Coral Gables (where I lived from 1963 to 1980): they never blow down in a hurricane! And CG does in fact have normal street signs on poles throughout its commercial and high-traffic areas. You didn’t mention Miami Beach. Getting from 5th St. to 41st St. by taking Collins is an exercise in exhausting frustration. Better to bypass South Beach by taking Alton.